When producer Alexander Korda introduced director Carol Reed to writer Graham Greene, it was the beginning of a fruitful collaboration that would produce Reed’s most enduring film, The Third Man (1949). The Fallen Idol is a tale of lies, deception, and half-truths as seen through the eyes of a young boy named Phillipe who lives in the French Embassy in London. Phillipe — or “Phile,” as he’s more commonly called (it’s pronounced the same as the name Phil) — is played by Bobby Henrey, a nonprofessional actor who was 8 or 9 years old during filming. This was the first time I’d seen The Fallen Idol, and while I was watching it I was struck by what an unaffected and natural performance Henrey delivered. The events of the film are seen mostly from Phile’s perspective, and his performance is central to the movie’s effectiveness. So I was surprised when I watched the 2006 documentary short A Sense of Carol Reed and learned that Henrey’s “performance” was largely created by Reed and his editor, Oswald Hafenrichter. In the documentary, Guy Hamilton, the assistant director of The Fallen Idol, recalled of Henrey, “He couldn’t act his way out of a paper bag. Much worse was his attention span, which was of a demented flea.” According to Hamilton, they’d sometimes shoot thousands of feet of film to get just one line from Henrey. Reed was patient and had a tremendous facility for directing actors of all ages. He never humiliated actors or cut them down in front of the crew. If he was unhappy with a take, he’d rarely yell “Cut!” until the actor had left the frame. On the occasions that he did, he’d do it in a tricky fashion, such as taking a nail from his pocket, dropping it on the floor, then calling out, “Cut! Can we have quiet, please?” Then he’d quietly say something to the actor like, “Since we have to start over anyway, perhaps you could…” — and get the performance he wanted that way. I don’t think The Fallen Idol would be as brilliant as it is had it starred a seasoned child actor capable of memorizing pages of dialogue. Henrey may have been frustrating to work with, but all that matters is what’s up on screen. Phile seems like a real child, not an adorable singing-and-dancing moppet with a studio contract. 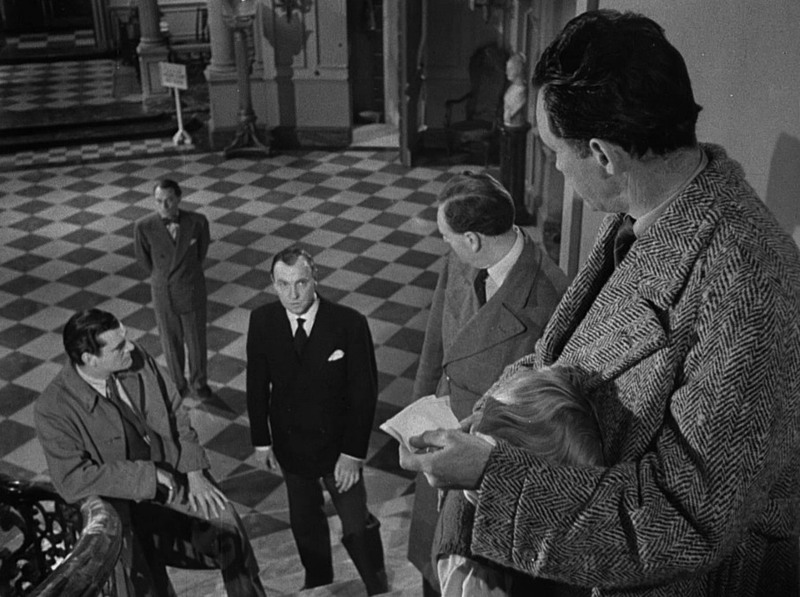 Phile’s parents spend very little time with him, and his only friend in the embassy is his father’s butler, Baines (Ralph Richardson). Phile’s nemesis is Baines’s wife, Mrs. Baines (Sonia Dresdel), a strict, cruel woman who has no patience for Phile’s antics or his little pet snake, MacGregor. One day, Phile follows his father figure to a café, where Baines is meeting a young French woman named Julie (Michèle Morgan). And just like that, Phile becomes an accomplice to his hero Baines’s infidelity. He doesn’t fully realize what’s going on — he believes that Julie is Baines’s niece and Baines doesn’t disabuse him of the notion — but any time a child is told by an adult, “No one needs to know about this,” the child will realize that something isn’t quite right. The film continues in this vein, and the layers of secrecy and deception build until Phile finally believes he has seen Baines do something truly horrid, and he clumsily tries to help his friend by lying to the police for him. The Fallen Idol is a great film. Vincent Korda’s set design is marvelous, and the spacious interiors of the embassy are as much a character in the film as any of the actors. Georges Périnal’s cinematography is full of unsettling Dutch angles and gorgeous chiaroscuro lighting. All the actors are wonderful, but Ralph Richardson’s performance is pitch perfect — he’s so kind and charming that we can easily see why Phile idolizes him, and when we begin to see the small, tragic man beneath the warm exterior, it’s heart-breaking. 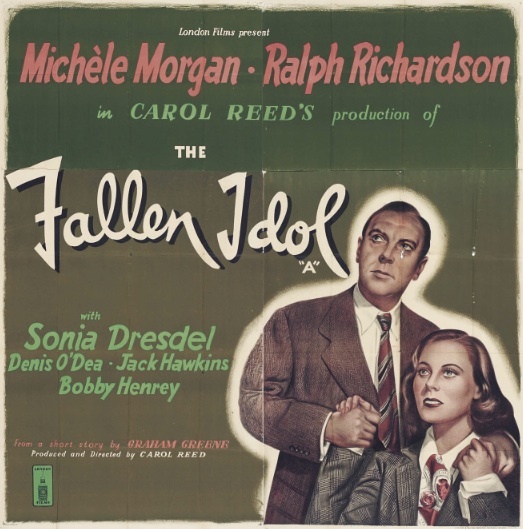 The Fallen Idol is tragic and moving in parts, but Reed and Grahame also have a very light, wry touch, and there’s a great deal of humor and irony in the film. If you’ve never seen it, by all means do so. If you want to make a triple bill of it, first watch Odd Man Out (1947), then The Fallen Idol (1948), and finally The Third Man (1949). They’re as brilliant a trio of films as any director has ever made. Posted in 1948, September 1948 and tagged Bobby Henrey, British Cinema, Carol Reed, Film Noir, Graham Greene, London Film Productions, Michèle Morgan, Ralph Richardson, Sonia Dresdel. Bookmark the permalink. Thanks, Joey! I definitely think you’ll like it. I rented the Criterion DVD, and it looks gorgeous. (Lots and lots of “Postcards From Shadowland” potential.) It also features the documentary “A Sense of Carol Reed,” which I mentioned in the review. Great stuff! If you do see it, drop back and share your thoughts. Listen, I’m co-hosting a William Castle Blogathon with Goregirl for July in honor of the 45th anniversary of The Tingler. Not sure if you’re a Castle fan, but I would LOVE to have you along for the ride if you’d like to contribute a review. Let me know! I am a HUGE William Castle Fan. I’ve seen most of his movies from the ’50s and ’60s (including The Tingler on the big screen!) and even shelled out big bucks for a copy of his out-of-print book “Step Right Up! I’m Gonna Scare the Pants Off America.” I’d love to be along for the ride in July. Keep me updated! Oh, and in case you’re curious, I’ve reviewed a bunch of Castle’s early B pictures for Columbia (for the Whistler series and the Crime Doctor series). You can see them here: https://ocdviewer.com/tag/william-castle/ … They don’t have the signature touches he would develop in the ’50s, but they’re fun programmers. 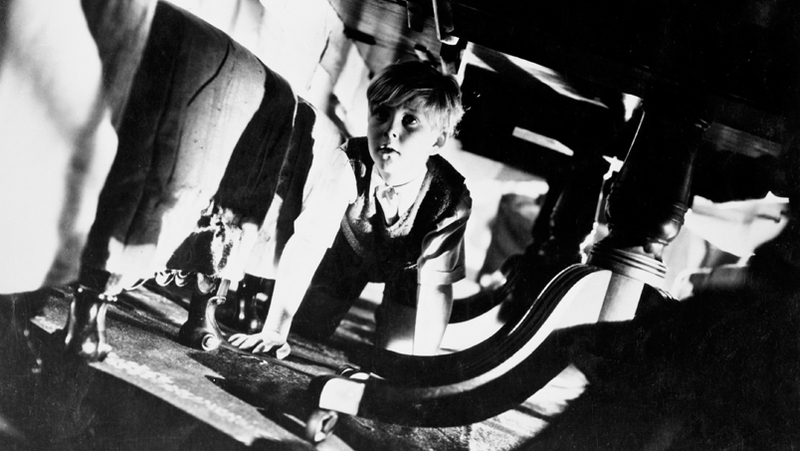 There were two different ideas about Bobby Henrey at the time from Carol Reed and his assistant director Guy Hamilton. Reed wanted a non-child actor like Bobby who’d never acted before in order to coax from him the perfectly natural and wonderful performance that he did, while I understand that Hamilton wanted a professional child actor who could do every scene in one take and never make a mistake, thus saving time and money. But Carol’s idea won out all the way. Guy Hamilton, talking about Bobby on the Criterion DVD extra “A Sense of Carol Reed”, gives the impression that he hasn’t seen the film for a very, very long time, because he says some things on it about Bobby that are both hurtful and completely untrue. For instance, that Ralph Richardson wouldn’t appear with Bobby in the film. This is totally ridiculous, as Ralph and Bobby are together throughout the whole film, even hugging each other at one point. Why don’t interviewers on DVD extras point out these obvious mistakes to the person being interviewed? Bobby, who had never been in a film studio before, was very distracted by all that was going on and was probably difficult to work with for the first few weeks until he got used to it. But if he had been as bad as Guy Hamilton says he was, he would have been replaced early on in the filming with another child actor…if they could have found anyone as remotely good as he was…but they kept him on to the end, many months later (the principal shooting lasted from September, 1947 to February, 1948). Bobby remembers it as a job where you turned up at the studio in the morning, worked all day with other people and then said goodbye to them at the end of the day and went home for the night. David Rayner, Stoke on Trent, England, UK, Thursday, July 16th, 2015.